I have gone around to various San Francisco restaurants hoping to get delicious pasta dishes like I can in New York, with depth in flavor and cooked al dente. I became skeptical, thinking that good Italian is doomed in this city. For every time I expressed my frustration, a friend would mentioned SPQR. 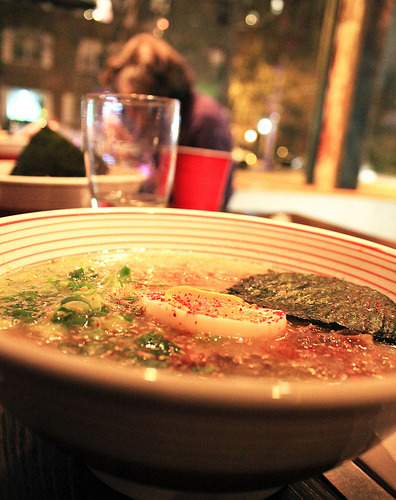 For that reason, I made the OpenTable reservation with a hopeful heart and a hungry stomach. 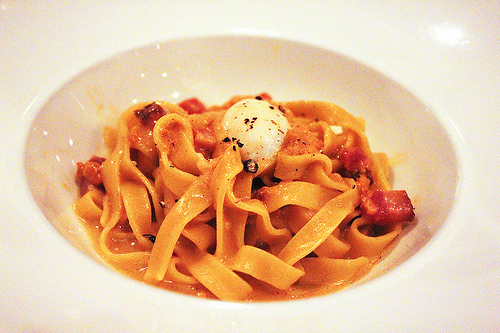 First thing I’ll say is that I can’t stop thinking about this pasta – smoked fettuccini served with sea urchin, smoked bacon and soft quail egg. It was cooked al dente and had the perfect combination of smoky and umami flavors paired with a creamy yet light weight to the pasta. Make note that this pasta isn’t always available, so check out the online menu beforehand. Okay, so let me back up – even going beyond their pasta dishes, I also enjoyed other selections on the menu. 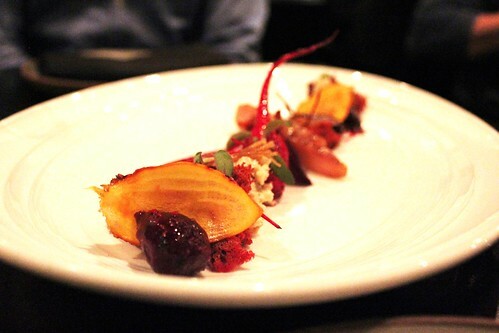 For example, the Smoked Sturgeon “Bacon” Salad with beet cake, pickled red beet and beet greens was tasty, especially for those who love beets. It had both savory and sweet elements, and even though I couldn’t taste much of the beet in the cake, it gave this dish great texture and lightness amongst the other components. 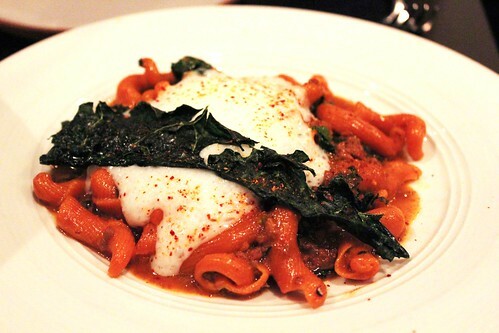 Another pasta I had was the Senise Pepper Torchio with dry aged beef bolognese, burrata and kale. It was good, also cooked al dente and not heavy at all despite being a meat sauce. Their “Degustazione” of Suckling Pork with green apple, celery root “millefoglie”, turnip and its ash was good. 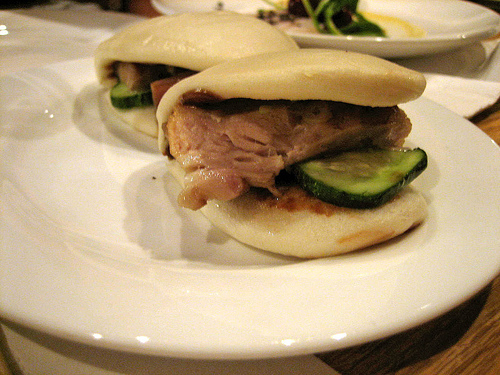 The pork was split into various pieces based on part (e.g. loin versus ear) and worked nicely with the sweet apple. Lastly, dessert. 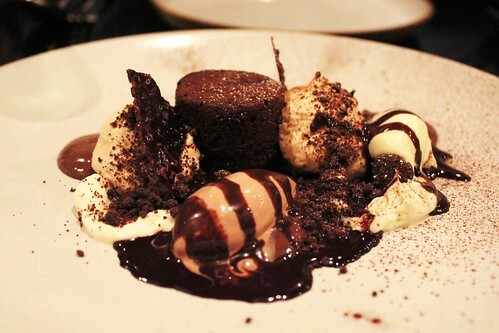 I had their “Coffee and Chocolate” which was white coffee gelato, liquid center cake, pudding, spuma, and cocoa nibs. Pretty straightforward: chocolatey, and almost like fudge, with hints of coffee. SPQR has become a glimmer of light in this city as a destination where I can confidently eat delicious pasta and taste modern Italian dishes. 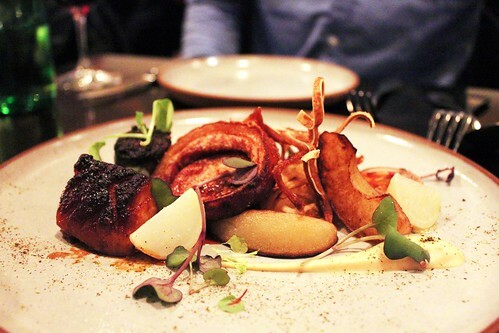 The accolades they’ve received from Michelin, Food & Wine, and Grub Street are well-deserved. I would like to check out again – taste some of their other seasonal dishes (note: anyone who wants to come with let me know) – and frankly, to have another solid tasty meal. So…maybe there is good pasta in SF after all!